Whilst Middle-Eastern boltholes like Dubai and Abu Dhabi have long grabbed the lion’s share of attention with their frenzied menus of tourist and business attractions, Kuwait has very quietly glided under the radar, preferring to offer a more genteel and measured pace. 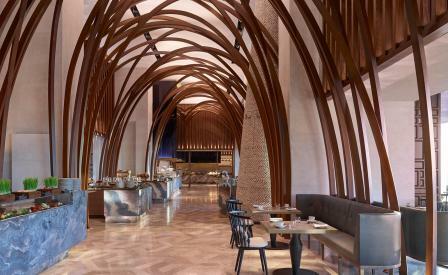 Qualities, incidentally, that inform the debut of the Four Seasons hotel in the new Gensler-designed sparkling water-fronted Burj Alshaya complex. Yabu Pushelberg have humanised the scale of the hotel’s vast interior halls with subtle renditions of Middle Eastern motifs, such as bronze accents on low-slung furniture; mashrabiya screens rendered onto towering columns, the floor-to-ceiling windows in the 284 bedrooms and suites, and privacy screens in the bathrooms; polygonal-shaped lamps; and soaring timber arches that recall the gentle bend of desert palms. Not that the designers have been shy to celebrate monumentality, exhibit A being the world’s largest crystal Lasvit chandelier in the lobby, the sprawling 438sqm Royal Suite, and the double-storey spa that features a hammam and psammotherapy suite. Shanghai-based Kokaistudios, meanwhile, were responsible for the hotel’s three anchor restaurants – Sintoho, Dani Forni and Elements – though there’s every reason to gravitate towards Al Bandar’s fourth floor terrace for its beguiling twin attractions of outdoor pool and shisha pipes.